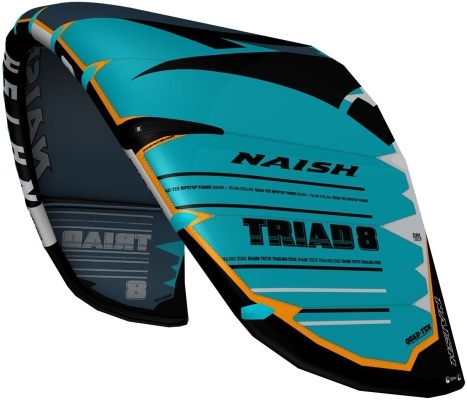 Bekijk alle details van de naish triad 2019 eenvoudig online bij TelstarSurf.nl. Geniet zo snel mogelijk van je nieuwe aankoop, bestel vandaag nog in de online surfshop. WHO’S IT FOR? Easy to control, the Triad is great for kiters looking for a smooth-flying, easy-to-handle kite or anyone that wants to improve their skills. WHAT DOES IT DO? Triad has a plethora of characteristics that make it ideal for your average kiter. Forgiving control, easy handling, great sheet-in-and-go with smooth power delivery, stable and neutral when not engaged, effortless water relaunch and amazing wing stability (when resting on the water) are a handful of these characteristics. WHY IS IT UNIQUE? This 3-strut platform makes it the easiest, most versatile kite around. PERFORMANCE DESCRIPTION The new Triad, is much more than an evolution of the Ride, it’s been redesigned and re-engineered. We’ve taken the original iconic user-friendly design and developed it further to be even more versatile and provide a whole new riding experience. This new, three-strut frame provides greater stability. The center luff strut creates great low end power, allowing the kite to drift and providing great sheet-in-and-go. The stiffer center also increases the Triad’s wind range, providing improved handling in stronger winds and gusty conditions. It also allows us to move the two outer struts lower for a more direct bar feel and improved turning ability. Its low aspect ratio and gradual curve in the wingtip produce smooth turns and very predictable flying. This is perfect for anyone who prefers steady movements over a more punchy kite. Mistakes are minimal with the Triad, so no need to worry if you oversheet it, dive it too hard, or overfly your kite. It also has great wing stability when resting on the water—so you have plenty of time to make adjustments before relaunching. Smooth-flying, stable and forgiving, the Triad gives riders plenty of time to react and plenty of room to grow, so you’re in complete control at all times. From complete beginners, to kiters looking to improve, to those seeking an easy-riding experience, anyone looking for an easy to control kite will enjoy the Triad.